Hey nommers! I am a few days behind in documenting my noms, so here’s a few pics to get you up to speed! …used up leftover quesadilla ingredients from two nights earlier, including the onion/peppers/black bean/corn/salsa filling. I opted to make open-face quesadillas this time, so maybe they are really Mexican pizzas now? Not sure. 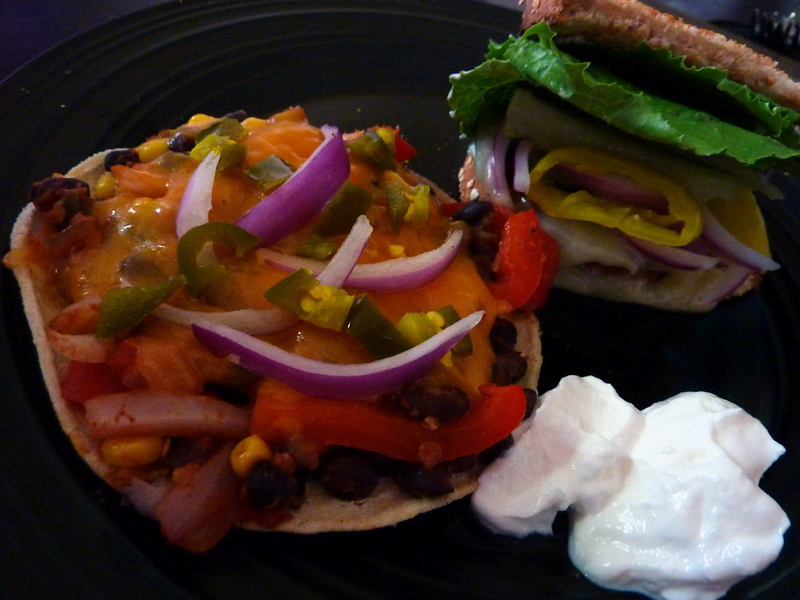 Topped the filling with cheddar cheese, red onion, and jalapenos. I also made a Morningstar Tomato Basil veggie burger with a slice of melty Havarti cheese on toasted wheat bread – yum! Topped with red onion, banana pepper, lettuce, and Miracle Whip. 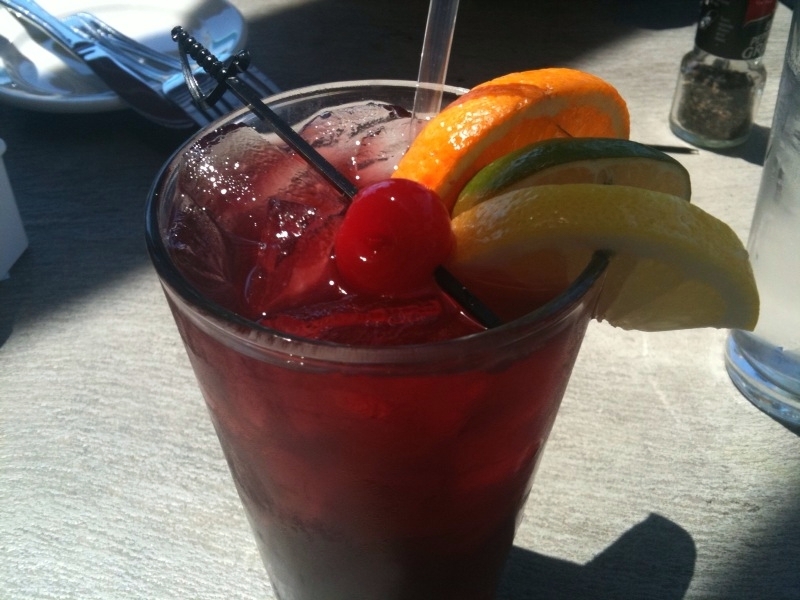 I only had to work a half day, and what better way to start a 3-(and a half) day holiday weekend than with an ice-cold glass of Sangria with lunch? 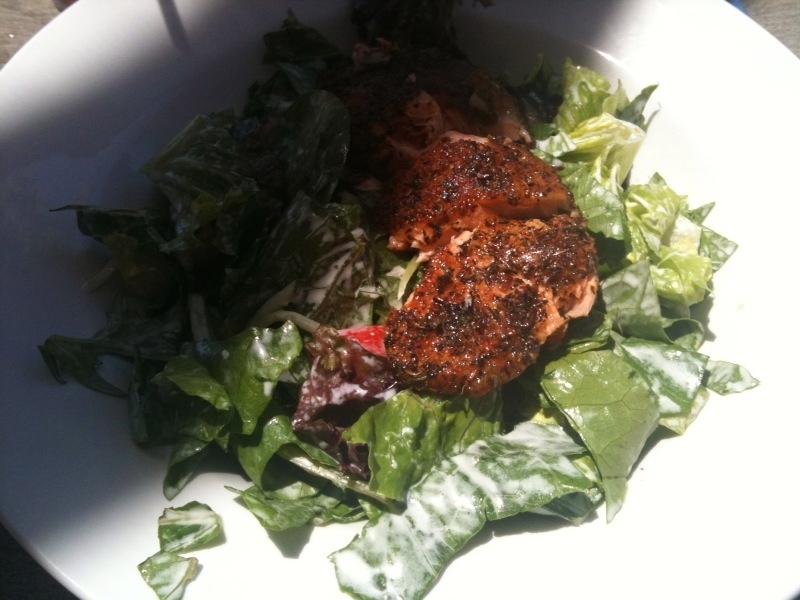 I grabbed lunch with a couple people from work at Carson’s and we all ordered the Blackened Salmon Salad. So good! The salmon was really hot and spicy, and there were huge chunks of cooked mushrooms and halved cherry tomatoes throughout the salad. A creamy, garlicky dressing lightly coated the greens. 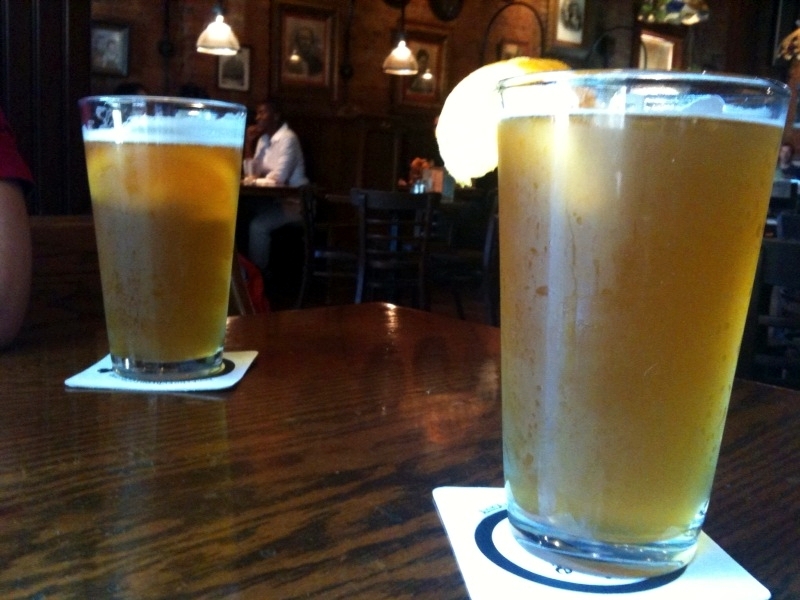 For dinner Tom and I went to Old Town, downtown, and started out with a couple ‘o brews – Bell’s Oberon. For dinner I ordered a Veggie Wrap filled with "steamed spinach, mushrooms, onion, tomato, and feta," and an order of sweet potato fries with honey mustard (which were ah-may-zing). The wrap was quite delicious too! It was piping hot (in fact I burnt my mouth a bit), and the feta gave it a nice tangy saltiness. Loved all the cooked sweet onions inside – glad they didn’t skimp on them! 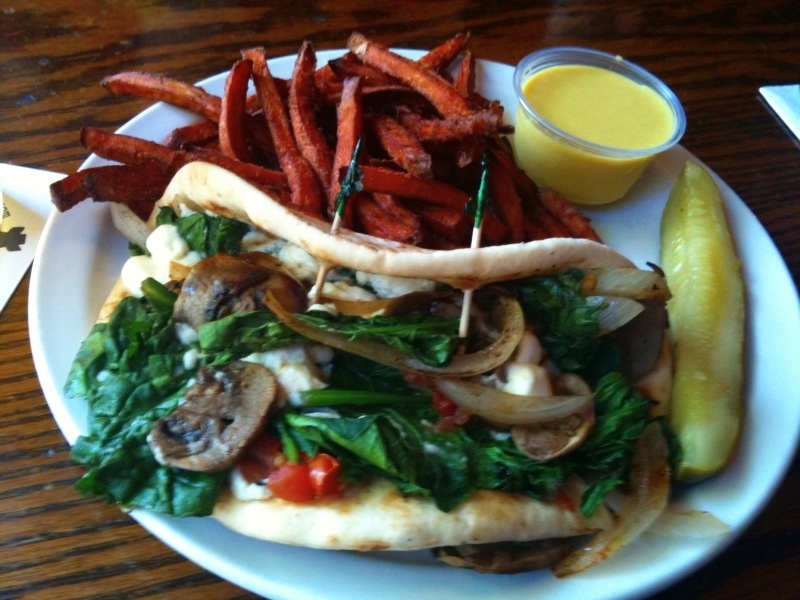 So much veggie goodness, in a warm, pillow-y pita. Even better than expected! I love it when that happens. 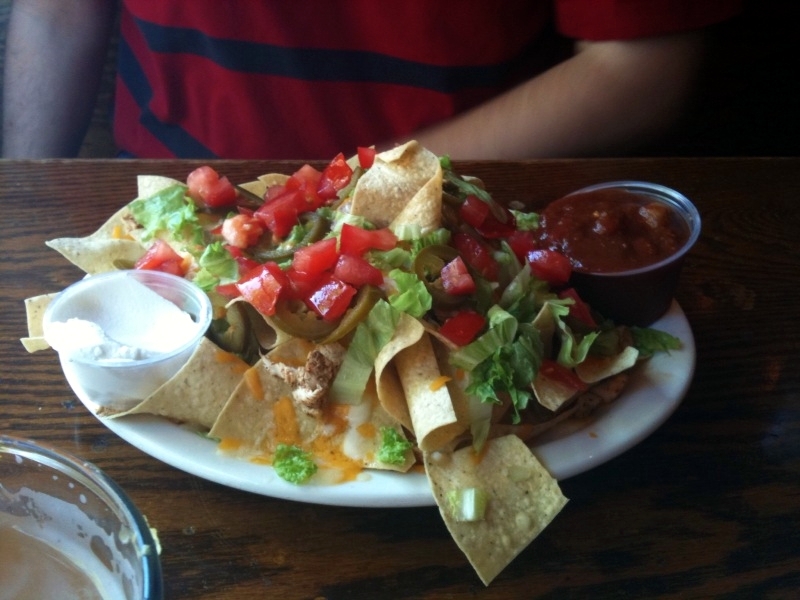 Tom ordered a platter of nachos for himself – "corn chips with melted jack and cheddar cheese, lettuce, tomato, onions and beans," with chicken on top. 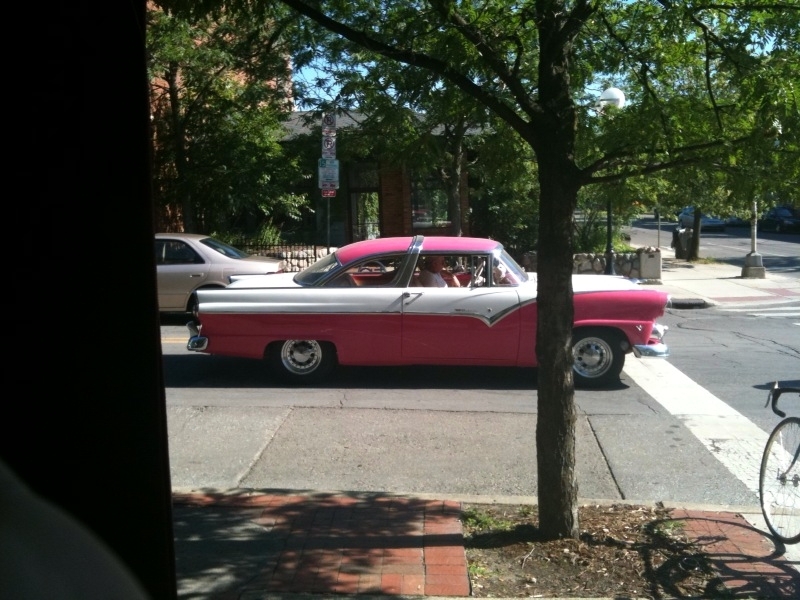 We were both very pleased with our food at Old Town, and liked the atmosphere and location. After noms and brews, we went to go see ‘Knight and Day’ at the movie theater. I thought this movie was a riot; I was laughing hysterically through the whole film. Tom Cruise might not be the sanest person around these days, but he’s undeniably a great actor, and…. how can you not like anything with Cameron Diaz in it? 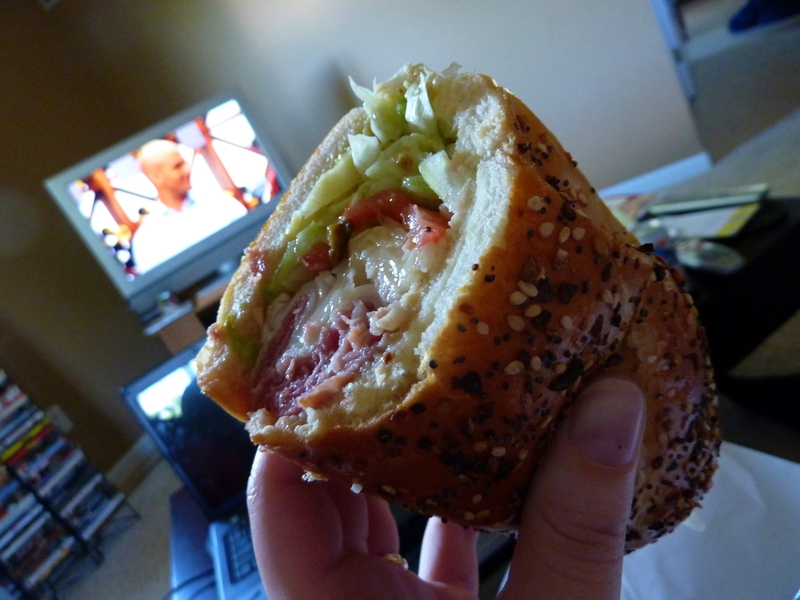 I applaud this blog- all the food above gave me a hemorrhage…good hemorrhage of course. Well, I’m not crazy about mixing fish and salad but still looked good. I totally agree- how you could NOT like Cameron Diaz?? She’s adorable. Pingback: Pumpkin Manicotti and How I Achieved Nirvana « Meg.Goes.Nom.Nom.